A while back we met with Reneta Ndisang a fashion designer with a couple of great events and design collections to her portfolio under the banners of TiaMacRen and now recently AfroShic. We had a video interview where she talked about her career as a fashion designer in Cameroon and More. Check out the video below. 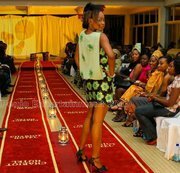 Y’all remember the extra classy and ones in many years fashion show: TIA-MACREN that took place sometime in November 2010 at CNPS hall in Buea, Cameroon? I know that was too much a show to have left the minds of everyone who was present, imagine a show even greater and bigger than that… Now stop your imagination this is reality ;). 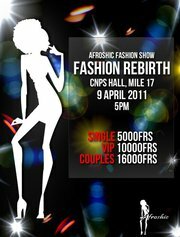 Coming to Buea,Cameroon in April is a ” jamais-vu ” fashion show big enough to take our breath away,strong just enough to bring fashion moguls from all over Africa, unique enough to bring fashionnisters from all over Cameroon and out to come and experience fashion taken to a whole new and different dimension.